Graphic with photo and text. 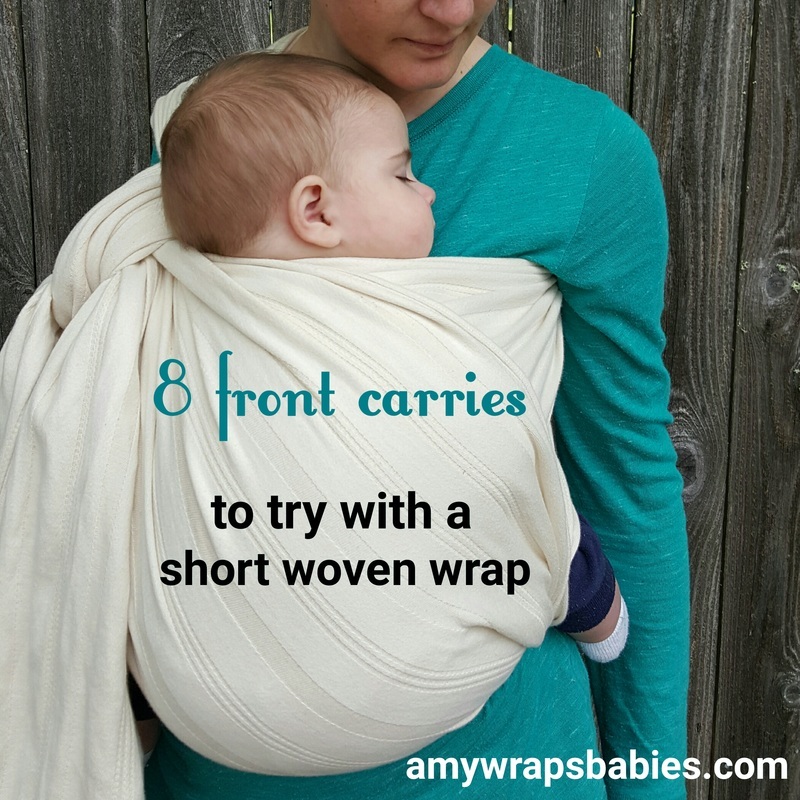 Text reads -quote- eight front carries to try with a short woven wrap. amy wraps babies dot com. -end quote- Image is Amy a thin white woman with dark hair standing in front of an old fence wearing her baby on her front in an undyed woven wrap. 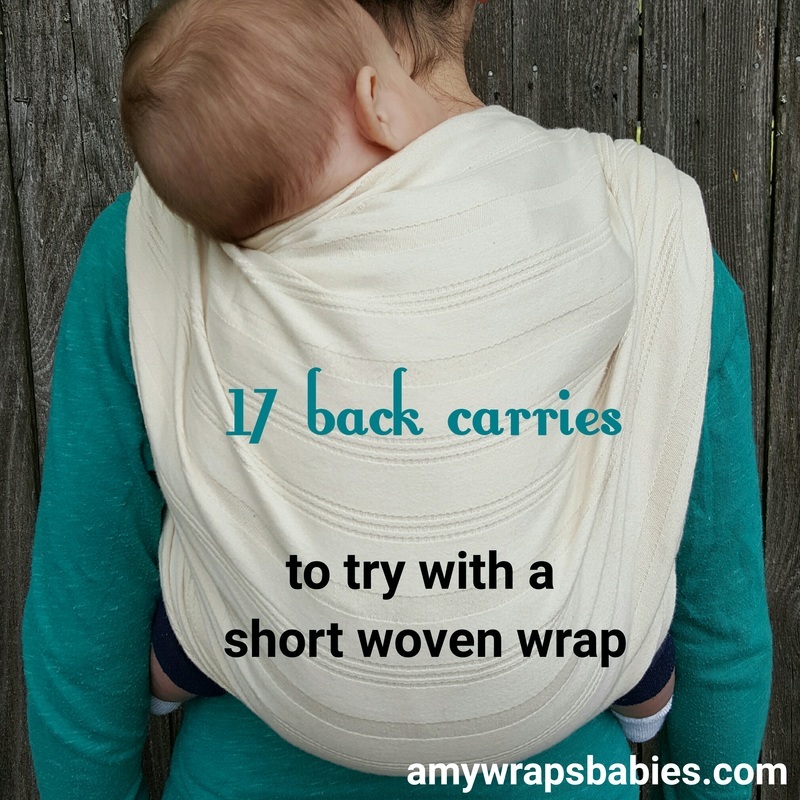 There are so many carries that can be done with a short woven wrap! Shorties are my absolute favorite so I'm delighted to give you some inspiration for what to do with them! We've focused this post and two companion posts, hip carries, and back carries, on base-4 to base-2 size carries, plus a post for shortie fancy finishes. Please see this post for more on what "base size" means if you're unfamiliar. FRTS (Front Reinforced Torso Sling*). Middle marker starts at underarm, bring short tail behind and over opposite shoulder and lower tail across chest, under arm, and around back to come to the front. Place baby in the pocket with both legs in (no cross passes). Bring the lower tail across baby's back to meet the upper tail and tie in slip knot. Jump to the latest tutorial on the tutorials page. NEW BONUS CARRY! Reverse Front Reinforced Torso Sling. Middle marker starts at underarm, bring short tail behind and over opposite shoulder and lower tail across chest, under arm, around back, and then up under the torso pass to connect to the shorter tail and tie a knot. Place baby in the inside pocket first (no cross passes) and smooth it up baby's back, then bring up the outer pocket. 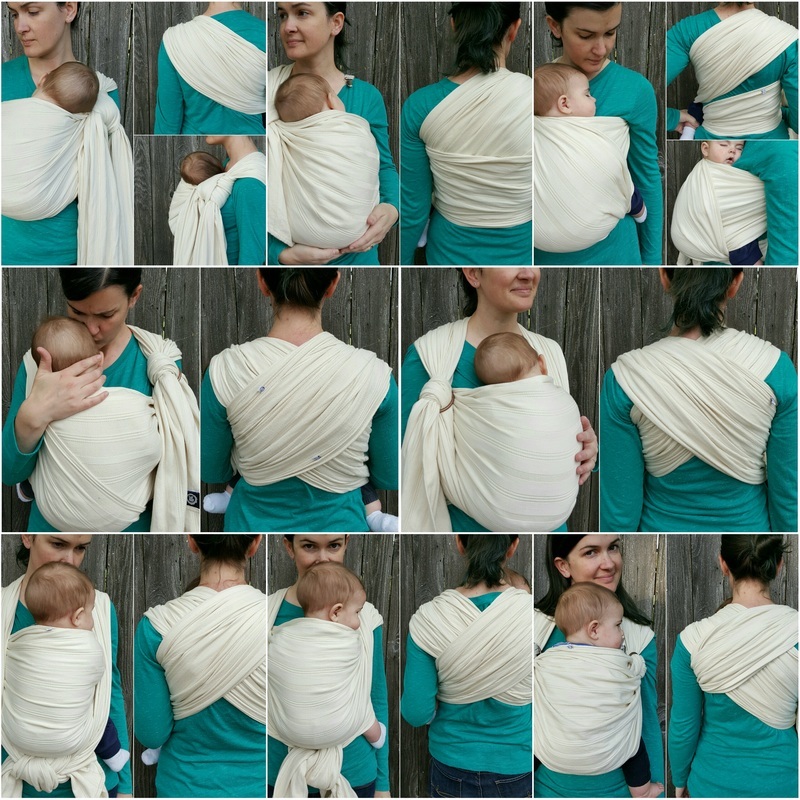 Tighten across baby's back and behind you, up into the slip knot. Jump to the latest tutorial on the tutorials page. Semi Front Wrap Cross Carry. Middle marker starts at underarm, bring tail behind and over opposite shoulder and lower tail across chest, under arm, and around back to come to the front. Place baby in the pocket with both legs in. Bring the lower tail under baby's knee and up across baby's back to meet the upper tail and tie in slip knot. Jump to the latest tutorial on the tutorials page. Half Front Wrap Cross Carry. Middle marker starts at underarm, bring tail behind and over opposite shoulder and lower tail across chest, under arm, around back, and up over opposite shoulder. Place baby in the pocket with both legs in. Bring the longer tail down across baby's back and under baby's knee, then up to meet the shorter tail and tie in slip knot or use a ring. Jump to the latest tutorial on the tutorials page. FWCC TAS (Front Wrap Cross Carry tied at shoulder). Middle marker starts at underarm, bring tail behind and over opposite shoulder and lower tail across chest, under arm, around back, and up over opposite shoulder. Place baby in the pocket with both legs in. Bring the longer tail down, bunched, over baby's knee, under bum, over the opposite knee, then up to meet the shorter tail and tie in slip knot or use a ring. Jump to the latest tutorial on the tutorials page. FWCC TUB (Front Wrap Cross Carry tied under bum). Middle marker starts centered on chest, bring tail under arm, behind and over opposite shoulder and other tail the same (under arm, around back, and up over opposite shoulder). Place baby in the pocket with both legs in. Bring both tails down, bunched, over baby's knees tie a double knot under bum. Jump to the latest tutorial on the tutorials page. Kangaroo. Middle marker starts centered on chest. Shoulder flips - take the bottom rail and place it on top of shoulder. Top rail should make a horizontal line across chest to arm. Repeat on the other side. Cross passes behind you (like a FWCC), bring bunched passes around front and tie. Place baby in the pouch and loosen the knot to adjust/tighten as needed. Jump to the latest tutorial on the tutorials page. Front Double Hammock, double rings. Jump to the latest tutorial on the tutorials page. Not pictured: Short Cross Carry Jump to the latest tutorial on the tutorials page. Looking for more inspiration? Check out the posts for hip carries and back carries too! Graphic with photo and text. 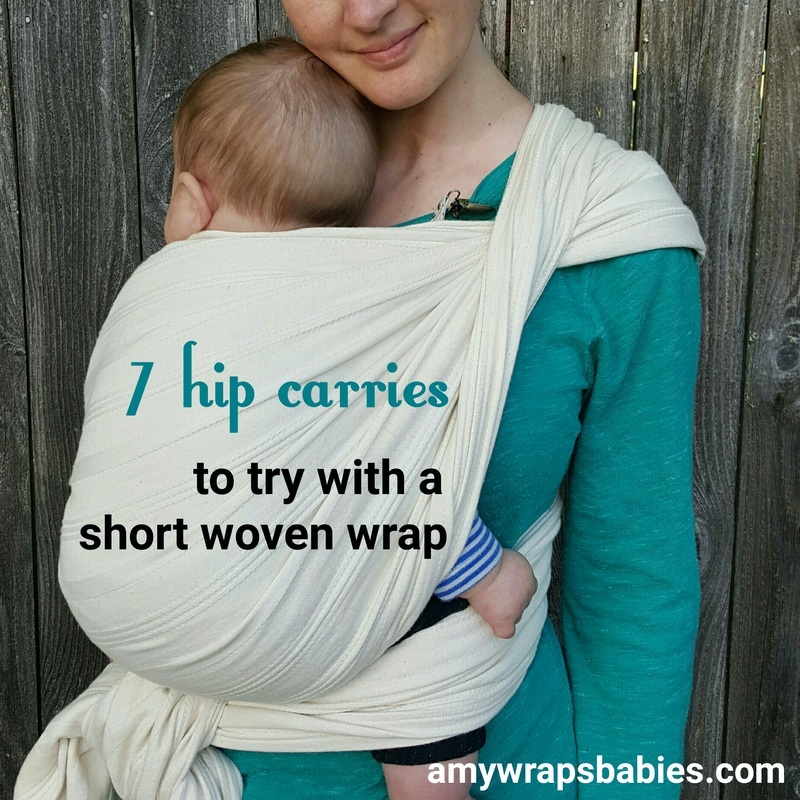 Text reads -quote- seven hip carries to try with a short woven wrap. amy wraps babies dot com. -end quote- Image is Amy a thin white woman with dark hair standing in front of an old fence wearing her baby on her hip in an undyed woven wrap. Graphic with photo and text. Text reads -quote- seventeen back carries to try with a short woven wrap. amy wraps babies dot com. -end quote- Image is Amy a thin white woman with dark hair standing in front of an old fence wearing her baby on her back in an undyed woven wrap. For more carries for a woven wraps of all sizes, see the Tutorials page.